In the past, no one ever thought of letting other people do their laundry; but as people became busier due to demanding jobs and family obligations, many of them turned to laundry and dry cleaning services to keep their clothes clean, and this is showing signs of huge business potential. Gary Anglebrandt recently reported for Crain’s Detroit Business on how one man’s ambition to operate a small dry cleaning business turned into something much bigger. But that’s the sort of business Wayne Wudyka runs. 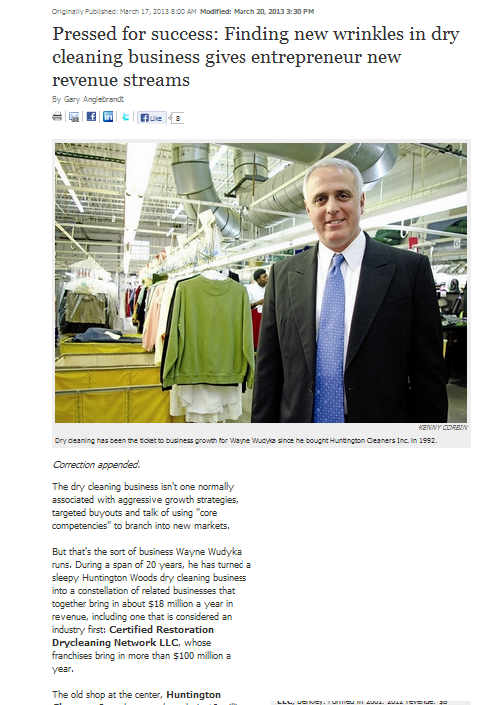 During a span of 20 years, he has turned a sleepy Huntington Woods dry cleaning business into a constellation of related businesses that together bring in about $18 million a year in revenue, including one that is considered an industry first:Certified Restoration Drycleaning Network LLC, whose franchises bring in more than $100 million a year. The old shop at the center, Huntington Cleaners Inc., last year brought in $8 million. CRDN and Wudyka’s latest venture — a franchise business that brings together old school (lockers) and new school (smartphones) technology; more on that later — stems from a growth plan based around that one store. Many people prefer to have specific items of clothing dry cleaned instead of having them machine-washed because that process is known to preserve fabric quality. As such, if entrepreneurs want to capture a niche market, they can learn from this humble Huntington Woods businessman. A comprehensive cleaning enterprise makes use of garment presses, tumble dryers, and of course, dry cleaning machines. All of these need to be equipped with quality Spirax Sarco steam traps for maximum output. As Wudyka’s business expanded, the company began to offer other services including textile restoration. This involves restoring any damaged fabric: clothes, drapes, area rugs, carpets, linens, and even stuffed toys. This service instantly found a thriving market, and for others who want to follow in these footsteps, they can consider investing in first-rate Sarco steam traps for their cleaning equipment. As increasing numbers of people rely on dry cleaners, machines and equipment should be made to perform at peak efficiency for longer periods of time. For supply of steam traps and other critical parts, trust only reputable suppliers like A.L.B. Industrial Supplies, Inc.